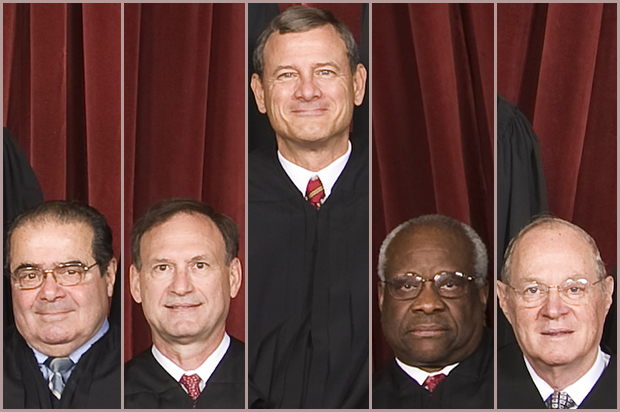 Right-wing justices have perverted our campaign-finance system. There’s a mechanism to reclaim it: The Constitution. By Jamie Raskin: Raskin is a professor of constitutional law at American University’s Washington College of Law, a Democratic state senator in Maryland and the Senate majority whip, and a senior fellow at People For the American Way. Our post-Reconstruction amendments have abolished slavery (the 13th), provided for equal protection of the laws and required reduction of states’ congressional delegations if they disenfranchise eligible voters (the 14th), denied states the power to discriminate in voting based on race (the 15th) and shifted the mode of election of U.S. Senators from the legislatures to the people (the 17th). They have passed woman suffrage (the 19th), given residents of the federal district the right to vote and participate in presidential elections by casting electors (the 23rd), abolished poll taxes in federal elections (the 24th) and lowered the voting age to 18 (the 26th). A lot of lawyers today react with horror to U.S. Reps. Marc Pocan and Keith Ellison’s excellent push for a constitutional amendment to establish an affirmative and universal right to vote against recurring state efforts to disenfranchise people. And a lot of academics were aghast last summer when every Democratic United States senator supported a constitutional amendment to reverse Citizens United, McCutcheon v. FEC (2014) and Arizona Free Enterprise Club’s Freedom Club PAC v. Bennett (2011). Some men look at constitutions with sanctimonious reverence, and deem them like the arc [sic] of the covenant, too sacred to be touched. They ascribe to the men of the preceding age a wisdom more than human, and suppose what they did to be beyond amendment . . . . But I know also, that laws and institutions must go hand in hand with the progress of the human mind. As that becomes more developed, more enlightened, as new discoveries are made, new truths disclosed, and manners and opinions change with the change of circumstances, institutions must advance also, and keep pace with the times. While Citizens United turned every corporate treasury in the country into a potential political slush fund, McCutcheon wiped out all aggregate limits on federal campaign contributions so that tycoons can now max out to every incumbent Member of Congress–plus all their opponents! The top half of the top 1 percent can now pretty much bankroll all federal campaigns, which is one reason why run-of-the-mill Republican millionaires and bundlers are complaining to the Washington Post that they have been bypassed in the nation’s wealth primary by “multi-multimillionaires and billionaires.” The bottom half of the top 1 percent is getting a sense of what it is like to be a political spectator in the country’s exclusionary wealth primary. There is a growing public anxiety and an out-cry about plutocracy becoming a key issue in the presidential election. Just about everyone lacks the financial advantages of Sheldon Adelson and the Koch brothers. The Republican party has already broken previous funding records by a hand full of the super wealthy citizens. The American citizens know that they can not match those funds. There is a need for a constitutional amendment to fix the damage done by Citizens United. If we wait for the current judges to retire, expect to see the few remaining campaign finance laws flattened by the Right Wing and the Court, including base limits on individual contributions, Regardless of what the Right or the Court claim, money is not free speech, Corporations do not need First Amendment or religious protections. They are using their wealth as bribery and the majority has witnessed what these laws have done to the nation that we love. In the last 6 years, Congress has ignored the majority of our citizens and the needs of our nation. If the five conservatives on the Supreme Court were scholars, they would of never passed the anti-Civil Rights decision or the Citizens United decision. The Supreme Court should not be political and influenced by money. Changing the Constitution requires hard work and cooperation. We have changed our Constitution in our recent past. The heroic movement for the Equal Rights Amendment in the 1970s not only led to widespread adoption of state constitutional amendments and significant federal statutory changes advancing the equal rights of women but also helped force the Supreme Court into action to apply “heightened scrutiny” to official gender-based discrimination under Equal Protection doctrine. We need to change the Constitution and it is possible. On the other side of the discussion not offered enough but since I at one time considered law as possible career and made it a point to follow court procedures and decisions…Whether rightly or wrongly we think the decisions of the US Supreme Court are written, their decisions always go back on the US Congress to rectify. They only decide on the Law as written by Congress, they do not delve into the politics of Law. When one reads each and every decision, each and every argument by each side, it is clearer. There are many times that I have thought that Congress writes laws so ineptly that they beg to be decided upon by the Supreme Court as to which way the decisions are to be made. It is only a question of politics when it comes from Congress. When they fail in their sworn duty to the US and fail in their duty to Govern All the people of the US, than the laws they write will come into the purview of the Supreme Court. Which basically means, that SCOTUS kicks the ball back in their court to either amend the law more specifically, or repeal it. In all fairness to the Court though, none of the cases would also not appear before them if the Lower courts had a better selection of Judges and that is were the politics can come into a decision more than it should. There have been cases when SCOTUS has kicked the case back to the lower courts because of inadequate consideration of Law in the findings, which is more or less a slap. Depending on how they word the return, it can be a hard one or a wrist one. 🙂 ….If it’s a hard one, with disdain included, no doubt in my mind that there are plenty of lawyers lined up to let the offending lower court Judge know how lax their judgment was which is rather a LOL right about than. I do so enjoy the cases where the obvious was missed by a Judge that was suppose to be on their A game. That also applies to Congress as well. Ecantados, If you don’t mind, I would like to ask you a few questions. I would like your opinions on both our Congress and Supreme Court. 1. Is it possible that the Supreme court created this situation with Citizens United? Money, influence and power have clearly moved the goal post. 2. Congress also played a role. In the last 7 years, Congress has been blamed for not filling positions in our courts. What role does Congress play in filling the lower courts with quality applicants? It does not seem that the Supreme Court is held in high regard. Not like they use to be anyway. i.e. I remember when SCOTUS suggested that it was the role of Congress to rectify ACA, everyone openly laughed. That response would of never happened 12 years ago. Ecantados does rightly blame Congress for it’s failure to fulfill its duty regarding the lower courts. She makes a very good point about that. Chief Justice Roberts has complained about the failure of Congress to fill lower court posts. But as everyone knows, Senate Republicans have been playing games with presidential appointments in a way that is unprecedented in United States history. You suggest that Supreme Court justices do not delve into the politics of law, which in principle should be true, yet almost every major decision made by this present conservative-dominated Supreme Court has been split along political lines. After accusing liberal judges of being “political activists” for decades, that oft heard conservative refrain magically disappeared when it became apparent that Republicans had managed to seat the most activist, if not downright corrupt, Supreme Court in United States history. Between 2005 and 2011, The Federalist Society for Law and Public Policy Studies received $1,218,799 from Koch Foundations. Between 1997 and 2011, the total money received from Koch foundation grants was $2,426,999..
Thomas’ wife at that time was a paid operative of the tea party movement funded and created by these same industrialists. Yet Thomas and Scalia both voted against the ACA, opposed by the tea party folks, when lower court justices would have recused themselves for fear of being charged with ethics violations–and Thomas’ household actually derived direct income from the same parties who were spending hundreds of millions of dollars to defeat the ACA. How convenient is it that an earlier ruling, the Citizens United decision, allowed Thomas’ wife to accept over a half million dollars from two secret donors? Gosh, wonder who has that kind of money? And those same two justices even had the audacity to attend a party hosted by plaintiffs in the case on the same day that they were to consider whether to vote against the ACA. Was anyone shocked when Scalia and Thomas voted against the ACA?